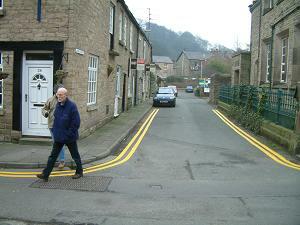 A short street off Water street, John Street is where Bollington’s iron founders were located, where Dean Court is today. There are fine stone cottages on one side and Water Street Centre on the other. Leads to – Dean Court wardened housing units are off the far end of John Street. The observant will notice, while walking around town, the number of cast iron components that still display ‘THE FOUNDRY BOLLINGTON’ (picture above) or similar. The most common pieces are the rainwater pipes that cross the pavements from the down pipe to the street gutter. Some gully tops and manhole covers also have ‘BOLLINGTON’ or ‘BOLLINGTON FOUNDRY’ cast into them. These were all cast in the foundry at John Street where Dean Court is today.